The holiday of Hanukkah celebrates the victory of the Maccabees over the occupying Greek Assyrians more than 2,200 years ago — which led to the re-dedication of the Temple. During the holiday, Jews memorialize the miracle of one day’s worth of oil burning in the Temple’s menorah for eight days by lighting a Hanukkah lamp (or simply, a menorah). Although Jewish law mandates that the menorah has eight equal lights, the rest of the design is up to the artisan. Among ancient Ashkenazi Jews, many were very poor — so not everyone owned a menorah. When they did, it was usually made of brass or pewter, which are less expensive metals than silver. Silver lamps are often very ornately decorated with animals, organic designs and sometimes figures such as an ancient Maccabee. Like any other form of Judaica, the older, larger and more ornate examples fetch bigger numbers at auction. The term menorah and the term Hanukkah lamp are often used interchangeably. A menorah, for the most part, is a free-standing candelabra with eight branches or arms that extend evenly out to allow for the insertion of candles or oil. There is usually a separate arm that acts as the sham mash (the servant light that is used to light all the other candles). A Hanukkah lamp usually has a back plate, and can be mounted on the wall or can also be freestanding. Hanukkah lamps usually have some sort of reflective nature to the back plate, as well as deeply ornate decorations. Early menorahs from the 17th and 18th century are quite rare, and often fetch top dollar at public auctions. Most of the ones extant were made in German silversmithing towns like Augsburg and Nuremberg. Few have survived through the years. According to Ashkenazic Jewish law, a menorah or Hanukkah lamp must have eight lights — all even, and in a straight row. But some Sephardic communities allow a semi-circle or round design. Still, as long as there are those eight even lights, all other designs and modifications to the menorah is for the most part, acceptable. This allows for extreme artistic freedom. One can see such traditional decorations on Eastern European menorahs such as stags, palm trees, the Decalogue, crowns, snakes and other repetitive designs. We also often see nationalistic designs, such as a double-headed eagle added to these pieces. Most Galician and Eastern European models from the 18th and 19th centuries are usually pretty folksy. Stylized lions are the principle motif. This especially holds true for wall-style Hanukkah lamps. They were mostly hand made — until the third quarter of the 19th century when machine production in Warsaw took over for the most part. Makers like Shmuel Skarlat, Ludwig Nast, Izaak Szekman and many others had shops in the commercial town of Warsaw, and often copied each other’s designs. This period from the second half of the 19th century all the way until World War II saw massive repetition in style and motif. Many of these lamps survived — as the mass immigration to America was in full swing from the last quarter of the 19th century all the way until World War I. I assume that anything left in Europe was destroyed or stolen by Hitler and his accomplices. Another popular style of Hanukkah lamp that we often see is the “Baal Shem Tov” style. The Baal Shem Tov was the founder of the Hassidic movement that originated in Eastern Europe. Tradition holds that the Hanukkah lamp that he used was made completely of filigree silver. There are varieties of this lamp — with the larger, more ornate models that are decorated with small silver animals achieving the highest prices. There is no direct proof that this model was actually used by the Baal Shem Tov, but collectors use the term. German Hanukkah lamps of the early periods (1650-1825 or so) are usually heavily decorated, and quite rare. They are usually much finer in craftsmanship and a lot less folksy than lamps made in Eastern Europe. Human figures are sometimes used to decorate the lamps, or as props for holding the servant lamp or oil jugs. As there have been very few on the market over the last 30 years, these usually sell in the $200,000 to $600,000 range, with the earlier, more ornate ones bringing numbers closer to the higher estimate. Towards the end of the 19th century, German silversmiths also started mass producing these lamps in the style of hand-made earlier models. The most popular one that we see is the “Lions” model, where each oil holder is shaped like a sitting lion with a wick holder extending from its mouth. The later the model, the more it has been recasted. With this comes the dulling of the details of the lions and other decoration, and brings down the value significantly. As we approach the 20th century, we find most lamps were machine-crafted, and were decorated with artistic designs and movements from whichever country and time period of manufacture. One can expect that a silver menorah from Germany from the time period of 1910 to1920 would most likely be in Art Deco motif, for example. 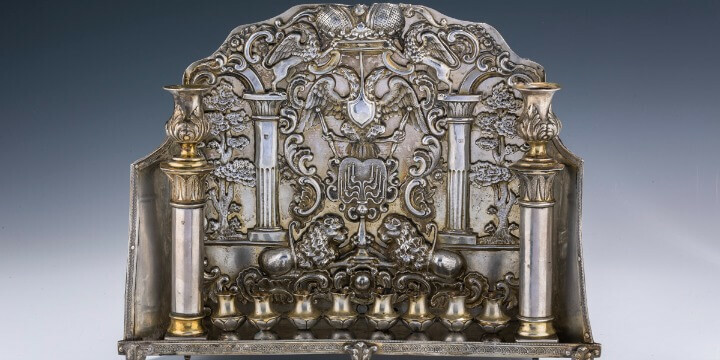 Large, ornate silver menorahs often fetch top dollar both in private sale and at auction because of rarity combined with aesthetics and decorative value. I find that the larger and more ornate the piece, the more that collectors value it. So tell me about your menorah! Email a picture to Jonathan@Jgreenstein.com.